Easy to use and open source - it seamlessly integrates with your existing apps so you won't even notice you are using it! Want an iOS app? Show your interest here. EteSync is very easy to use. Our app seamlessly integrates with your existing apps so you won't even notice you are using it. Security doesn't always have to come at a cost. Thanks to zero-knowledge end-to-end encryption, not even we can see your data. Don't believe us? You shouldn't, just verify yourself, all of the code is open source. A full history of your data is saved in an encrypted tamper-proof journal which means you can review, replay and revert any changes you have made at any point in time. EteSync integrates seamlessly with your existing apps. All you need to do is sign up (or run your own instance), install the app, and enter your password. 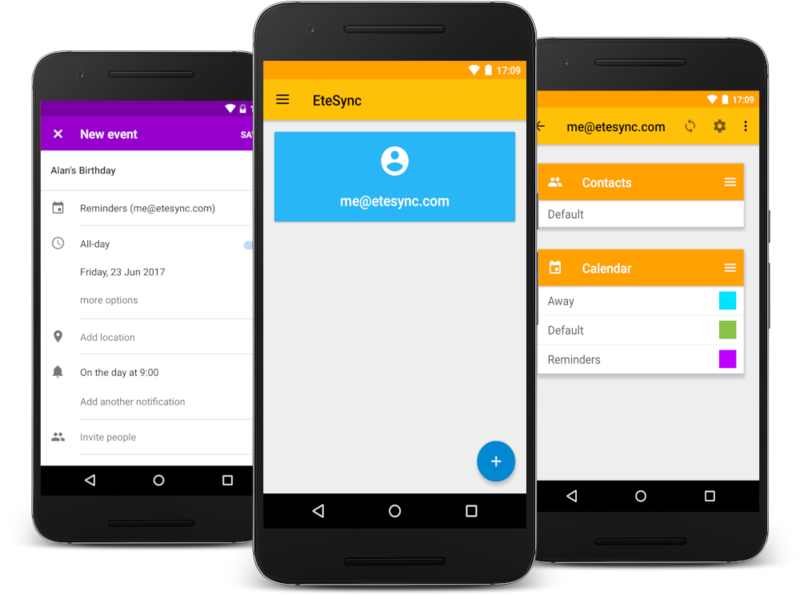 After that, you will be able to save your contacts, calendar events and tasks to EteSync using your existing apps, and EteSync will transparently encrypt your data and update the change journal in the background. More security, same work-flow. EteSync is fully open source. The client, the server and everything else. The source code is hosted on GitHub and is available for everyone to review, audit and contribute! We believe that being open source is a requirement for any secure application. Without the source it's hard to trust an application is doing what it does, and if you can't trust the application, how can you trust it with your data? We are happy to announce the new associate accounts! Improvements, fixes, pricing and the fair pricing initiative. New features and exciting news across all platforms! We are happy to announce the beta release of the new EteSync progressive web app! You asked for it, and now it's here! Hosting your own EteSync instance is now easier than ever before (and a few other updates). Development status, important features and news. Click here for the release announcement and future plans. We are happy to announce the first release of EteSync! Click here for the release announcement and future plans.